It is best to start with cold cooked chicken. dice the chicken into small pieces. Place the Chicken into a large bowl. In a smaller bowl, combine the mayonnaise, garlic powder, onion, and black pepper. Mix well. Now put the mayonnaise mixture into the bowl with the chicken and mix well. Then stir in the celery and nuts. Congrats, you now have chicken salad. 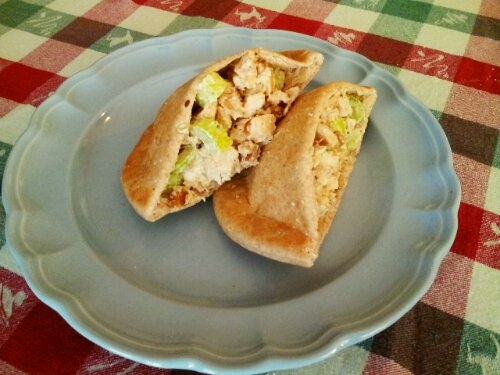 Take your chicken salad and stuff it onto your pita pockets. You can also serve this as a sandwich between two slices of bread but that’s pretty boring.